January 10, 2010. 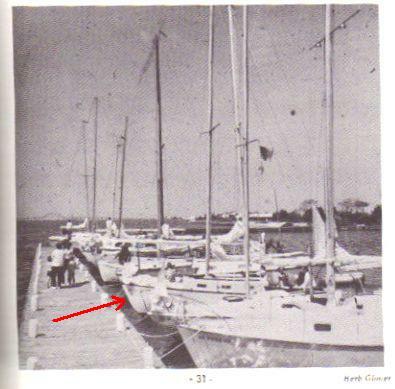 Ian Holzmacher, (Wanderlust, #122) discovered some old South Bay Cruising Club yearbooks, one of which had three Dolphins listed. Here is his email with webmaster notes inserted. I was searching through some old South Bay Cruising Club yearbooks. I found three dolphins in the 1968 yearbook. I also found a picture (of a Dolphin) in the 1968 yearbook, taken in 1967. Its the third boat from the bottom in the picture. The boat could be of any one of those boats. > 1970 through 1981 was James Heacock, the name was ''Jimel'' Smithtown N.Y.
>1993 through 2010 was John Kelleher, the boat had no name. North Babylon N.Y.
Webmaster Note: Another interesting item from the 1968 Yearbook above. The designer column lists "Shaw", in one case "Shaw (S&S)". We know from the Dolphin 24 birth certificate that Bill Shaw was on the team at S&S that designed the Dolphin 24 - and probably was the lead designer. 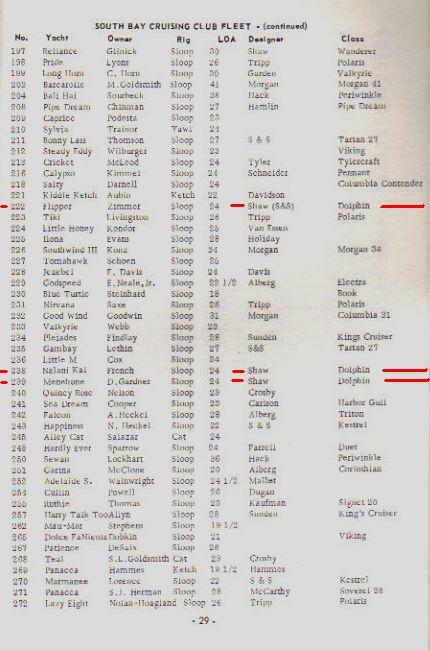 George O'Day specified that Trina, Bill Shaw's Shaw 24 hull #1 be a design guide This is the first 'ancient' document we have come across that actually lists him as the designer.